John Massie, known to his friends simply as Classy, the homeless man who died in Toronto outside a bank ATM lobby from burns he received after accidentally setting himself on fire while smoking and drinking, was not the first homeless person in the past year to suffer a similar terrible fate. 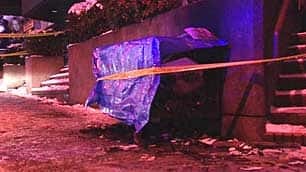 In Vancouver, in December, a homeless woman identified in CBC reports as simply, Tracey, died in mid-December on the streets of Vancouver. According to the report, the body of a middle-aged homeless woman was found burning in downtown Vancouver after she apparently tried to keep herself warm by burning candles in a temporary shelter she had built over a shopping cart. The report also mentions a further death in Vancouver of a homeless couple taking shelter outside – the homeless man died and a woman with him was severely burned in January when their portable stove exploded as they used it for warmth while sheltering in a Vancouver alley. How do we make a difference? Where do the changes need to start? When will the misfortune of ending up homeless cease to be a virtual death sentence for so many? Check back to blog as we look into these crucial questions and seek for groundbreaking, grassroots methods to save our homeless friends. If you’d like to take part in a Project417 street outreach program in Toronto visit Project417.com to find out how you can help the homeless. Homeless do deserve a better life with the help from the city and its residents. Thanks for pointing this up. Twenty volunteers from Bracebridge came with our friend Marlene to help us out on the streets last night. It was -30 with the windchill. We handed out almost a hundred meals, plus socks and wool hats – find out how you can help too!